June 8, 2014 V S.
The third time’s the charm, as France’s official Cheese Ambassador to the world, Gérard Poulard, is back by popular demand to our very own Scarlett wine bar & restaurant in June 2014. On this visit, this famed “Maître Fromager”, the Cheese Master, will present his 2014 Collection of Fromages de France, bringing with him 150 varieties of French farmed cheese from the best of France’s boutique producers — available at Scarlett in June & July 2014. 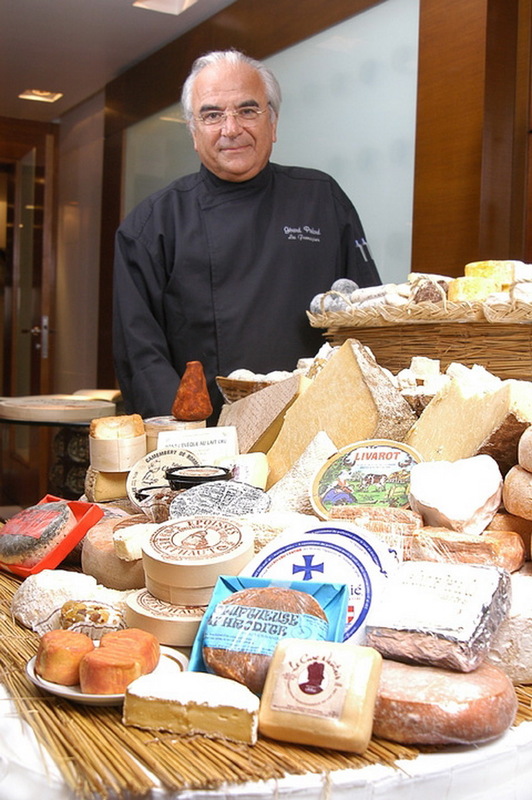 Since 1999, Gérard Poulard has become internationally renowned as the world’s expert to the enjoyment and presentation of the fine cheeses sought after by gourmet dining restaurants in over 22 countries around the world. In collaboration with his son Olivier, he has received an ever increasing list of prestigious awards for his knowledge regarding France’s most delectable exports, including The Order of Agricultural Merit, the Cordon Bleu France, and the Prosper Montagné from Quality House. For over 20 years, the Cheese Master has travelled throughout the French countryside discovering its varied history and culture, especially every nuance concerning his favorite topic: cheese. His knowledge about France and its countryside is so vast that he sometimes even knows the name of the goat or cow from which the precious milk has been drawn. Extremely passionate about cheese and his incredible collection of its knowledge, behind the cheeseboard, in front of the customer, Gérard Poulard impresses and arouses the desire of those who meet him, speaking about the unique flavors of various cheeses and allowing time to look at the cheeseboard. He carefully asks each guest about his cheese palate. Come to Scarlett Wine Bar & Restaurant and meet the Cheese Master himself. Gérard Poulard will visit during 7th – 15th June to demonstrate his expertise in perfectly arranging the tastes and textures of a wide range of France’s numerous cheeses into various mouthwatering combinations with breads, cold cuts, wines, fruits and teas. Fantastic cheeses such as Fourme Laqueuille Memee Aoc, Rigotte de Condrieux, Bouyguette du Segala Romarin, and so very many more, are on the way. Among them are a selection of exquisite goat cheeses from France, a lesser known but delicious variety of cheese that possesses numerous health benefits over that made from cow’s milk, including being substantially lower in fat and calories. Goat cheese is also higher in protein and calcium, as well being a good brain food that boosts metabolism and has heart beneficial properties along with other nutrients. There really is no excuse not to make this date with Scarlett and the Cheese Master. His presence supported by China Airlines! เปิดบริการ จันทร์ ถึง เสาร์ (ปิดวันอาทิตย์) ตั้งแต่เวลา 18.00น. ถึง 01.00น.